Twenty-something Vikram rebels against his father and the mediocre life his engineering background has ordained for him by travelling to Delhi to become a stand-up comedian. Only, he is forced to see the serious side of his jokes when circumstances compel him to accept the position of a journalist at The Great Indian Democracy, an upcoming political magazine. Life drifts along through plagiarized articles and pub-hopping until one day he finds out why he was hired in the first place. And meets Advaita, the annoyingly beautiful intern with whom he falls in love. I received this book from ‘Pirates’ for an honest and unbiased review of the same. The first thing I noticed about the book is the cover page – it looked inviting and promising. As Indians, the citizens of the biggest democracy of the world – we are quite aware of what entails a democracy – its plus points, its loop holes and everything else that is associated with it. With the Lok Sabha elections happening in the country, this title seemed quite apt to me to pick up. The blurb had quite raised my expectations and I was hoping that the book will offer me a new way to look at the state of democratic affairs in the country with a good lot of satire and humor. The book started well, but didn’t quite live up to my expectations in the end. I was hoping that there would be something more substantial on the ‘stand-up comedy’ thing, but it seemed like that it was lost amidst all the other things that were happening in the book. The story line of the book is quite predictable. A lot of unnecessary things fill the pages at times – I couldn’t fathom how the weird description on the categories of girls contributes to the story in any way. Rather, I found it distracting. The writing style is simple which makes reading the book quite effortless. But, doesn’t the story make an impact on it readers? Let us find out. The character of ‘Vikram’ failed to make an impact on me. Also, I didn’t find the character of Advaita all that interesting. To give the book a political flavour, issues that plagues our democracy are discussed throughout the book – there is nothing new or innovative about them and they are not even written with a new perspective. The only saving grace for the book are the various supporting characters like Ramesh Anna, Sus Cheta, Baldy – Vikram’s Boss, etc. They do lighten the read sometimes and somewhere add to the fun quotient; but, not as much as one would expect. 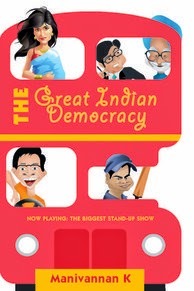 Marketing this book as a comical satire on Indian democracy doesn’t work as the humor promised in the book is pretty much non-existent. If you are picking up this book for the humor it is promising, you are going to be disappointed. I feel the book could have done better had the title been different and it was marketed differently. It is an easy read and you could pick up if you want a light read in between serious reads. If you don't expect the things the book promises, you might even like it.